a little practice, they always turn out well; even children can help with the preparation. All ingredients should be at room temperature. Sift the flour into a bowl. Break up the yeast and dissolve in the lukewarm milk. Combine with the oil, sour cream, 2 egg yolks, salt and sugar. Add to the flour and knead into a smooth dough. Cover the bowl with a tea towel and let rest for 30 minutes. Put the dough on a flat surface and knead again. Form into a roll and divide into 5 equal portions. Take one portion, roll into a round shape about 3 mm thick. Starting in the centre, cut into 8 equal-sized triangles. Roll up from the wide end to the point. You can fill them with chees or jam - or even not. Bend into crescents and place 1 cm apart on a greased or parchment-lined baking sheet. (Yeast dough will expand during baking) Repeat this procedure with the remaining 4 portions of dough. 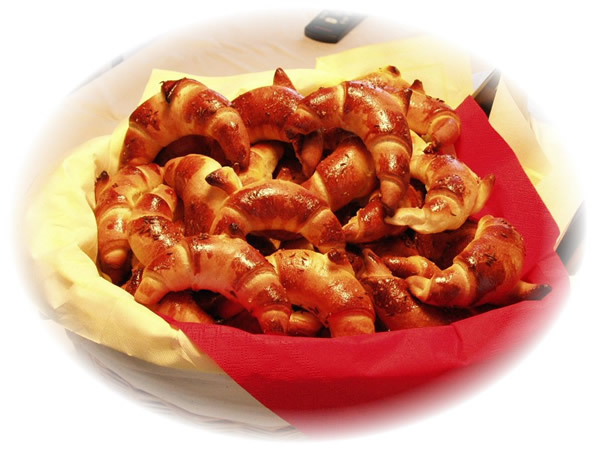 Yield: 40 crescents. Glaze: Lightly beat 2 egg yolks with 2 tbsp. milk. Brush on crescents and sprinkle with coarse salt and caraway seeds. Let rest another 10-20 minutes. Preheat oven to 240ºC. Bake on the middle rack for 15 minutes (12 minutes in convection oven) A baked crescent weighs about 30-40g. Allow about 5 crescents per person. They are best when freshly baked, but they can be frozen and reheated before serving.